Also nuckalavee can be demonic as in the traditional folk tale.. but probably better to leave their origins mysterious, unless PCs discover it. Great names for locations and interesting castle! I agree, Yet I am pondering, if and where this monster could be placed. Great You're content, then I can continue. As the Ethengar Plateau was much lower, and much more moist due the melting snow, grain and corn was grown on the fields, though low in produce, the vast volume, enable enough to feed the Populace of the New Blackmoor Colony. In the 3000BC disaster, the easterrn side of the plateaux was lifted, and tilted, beginning its slow rise upward, the 1700BC disaster, further increased this rise and tilt, which only recently( 800-1000AC) seems to have been stabilized....yet this is still unsure.. New cells of the Planet Megalith might come to grow deep under ground, and this in their expansion of growth might push the Plateaux up much further in the future. IF...this happens, the cells are formed in the last 200 years and they might start expanding in the next 500 years,lifting the Plateaux up a further 300 to 1700 feet,(depending on the size of the cells) and might break along the Bargha northwest-south axis. If this happens , Ethengar will become the highest Plateaux ever, seperating it from many locations. Earthquakes and tremors will become a part of daily processes, and a part of "normal life"
It remains however, uncertain if this will indeed happen. Eitherway Ethengar in this future will change greatly...more on this later. Last edited by Robin on Sat Nov 10, 2018 12:57 pm, edited 1 time in total. 01-10-2018 starting to implement the old streel river remainss of 2300BC...i am not yet sure what it might be, another smaller stream, a mudbed, a dry ditch, a swamp, a collection of lakes, or all of the above,. due the linear north soth line of the new streel I suggested (see above) the existence of old canal diging by the ethengar (or Others), but awaiting the 2300bc information of chimpman to be certain. I also placed the Lake in the North from Betti's map, as I felt this a natural , logical fitting and location of something to break up the monotony of the grasslands. 09-11-2018 Went on detailing the western section. added some more creeks, where these would naturally begin , coarse and end. Some of these Spawn from the Hills of the Gostai Goblins, travel several miles and then end...(in a muddy lake) ...as the surplus of the water is too low to create a flow further...it simply evaporatesmostly before reaching these destinations, except in Autumn and Spring . Slowly this section travels towards a more or less final object. It feels more and more like it has to be. There is less and less monotony visible. Most work will be placing the altitudes ...Which I am looking up against. And please any comments (and I mean ANY) tell them me..
As good or bad, the map will grow in detail and result due this. How nomadic or semi-nomadic are the Ethengarians? Do they just switch locations twice yearly or is it every month or two? Does the same clan return to the same place(s) every season? I didn't think they did. If they don't, then I wouldn't suggest having marked campsites unless you want to specifiy a time stamp for your map. Even if they do always return to the same place, or if you just wanted the map to be vaguely representative of the density and distance "typically" between clans, then since clan names change I'd still suggest not having names on those sites, again, unless you want a specific time stamp for when your map depicts. As Gaz 12 says . 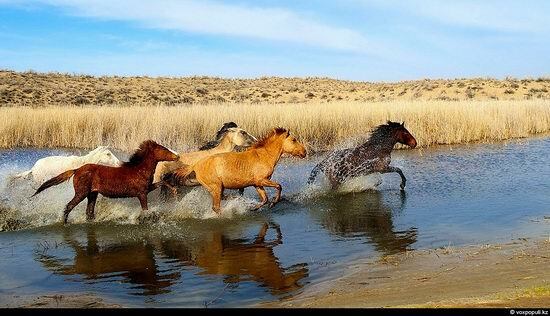 of the build up of a clan, that they during spring and summer months wander the steppes following their herds, only joining with other clans at horse fairs and to wait out the long winter koths at the Tribal Camp. The text in the DM and Player books does not explainif the clans wander Whole Ethengar, or only their Tribal Lands...especially in times of scarcity, I assume the last would be more logical (of course with border skirmishes, grazing theft, cattle theft, etc.....not counting any monster anf humanoid influences) However, as Chagon Nah, Xantha, and Bargha are important cultural locations occupied seasonally, It can also be assumed the clans mix freely in the Spring and summer and return to the tribal lands and then individual camps. It is indeed not really fully clarified, as far as I coukld find...I have to check.It seems thus these camps I noted on the map are only the winter camps. 11-11-2018 Placed several new Mage towers hex symbols in the Glantrian Lands (Pink), and new ruins symbols(dark grey and more diferrentiating than the standard ruin hexsymbol). 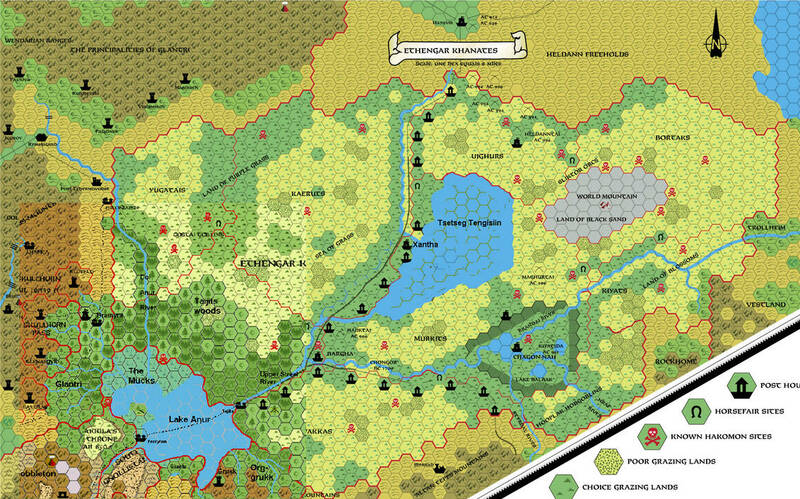 Beginning study of the Heldann region, and starting to work on the upper Streel. Chimpman, I hope, works on the Locations(now Hakomon Locations) from 2300BC Kargythyne. That is also the reason I laid that map section on temporary hold. As the Streel River had a very diverse original course, and a fe hundred years later the more know Straight one....this could only have happened by human influences...I had to place the Old streel as a drying mudbed in it own riverbed, and the new Streel with hills of dugout material (overgrown with grasses) next to it, functioning as dams. Not only seems this functional , by keeping the river within a region where it can wander, it also minimizes the risk of the water returning to its old bed, added with some erosion, filling the Sea of Flowers...and brings more variety to the land...the old and new river beds, with all their biological effects clearly bring variety. The Current(1185-1200AC) Golden Kahn aleady had to accept the Streel no longer flowing through the Broken Lands (this will happen somewhere in the year 1020AC to 1025AC---and will be explained in my Blog in the nearby future) and the recreation of the Anur Lake of centuries gone by. He saw the increase in fertlity of the land, forests growing around Anur Lake, grains bringing richnes in food, and more animals to hunt. As the Streel was rerouted hundreds of years ago, it was a reasonable simple matter to dig a new channel towards the Sea of Flowers, break the dam and let the Streel also fill the Depression of the Sea of Flowers. This increase in water would certainly bring more fertility in Central Ethengar, and hence growth and wealth to the Khanates. Some clanborders have shifted due this, and some disentment among the tribes has spawned over the last 200 years. The Kahn hopes to bring the tribes together through growth. For the 1 mile hexmap...it is now bringing more detail to the east side of the map, placing seasonal tribal camps as I did in the west section, create the last Hakomon location on this map, and prepare the N map to be able to attach this one perfectly. I infused more detail, (Caves in mountains, hills grassy hills), Dispersed poor and rich grass on either field, making is more diverse. I also created locations of former hakomon locations, which now ceased to have any effect....other than the changed environment. Great interesting hexes, I use gimp mostly, and eventually I'd like to add them to my gimp palette, thanks for making them! Brought in much more detail to the SW map. Created Hakomon locations, and even some former hakomon locations which are now interesting locations without any magical effect.More on this in the Hakomon location post. Ok continuing the research on the altitudes. Some things become very clear now. First two levels Aral Lake pre 1700BC at 540'altitude and Grondheim Lake which came to be after 1700BC, reached it major size 1500BC which decreased since 500BC. Secondly, something I mentioned earlier; the straighth southbound new Streel. This is most logically an canal/redug river. As the 1700BC disaster, it tilted the plateaux, it also might have changed the river, yet as the Old Streel was only 2 miles away from the edge of the Sea of Flowers, it deems more logical that the early Ethengar (probably with Dwarven help) tried to prevent a disaster and diverted the Old Streel into the new Streel river bed.. Especially dwarven engineering and knowledge of digging, but also the many horses available, must have made it reasonable easy to dig, dump the dugup earth as a wall nearby, and in the end exchange the dams where the old and new Streel cross(top north and NW of sea of Flowers) diverting the water from the old bed into the new. The old bed would then slowly dry out. Traces of this make it a muddy or even swampy region for many centuries and this can be seen to today. Thirdly; It also reveals where the forests were located fed by the lakes. these will also have many traces of this still visible. Sunken dried trees and trunks. fallen trees (of which over the years many have been used as feul/material), creating a special environment. These fallen trees/logs are good for rodents, birds and such to hide from predators, and thus create a specific habitat. In game terms I would make traversing these areas on horse 6times harder in time or covered distance in a time periond, but also influencing directional orientation making straight directions literally impossible (unless using orientation skills/tools and excellent maps or local knowledge). the chance to getting lost (or unknowingly redirected) is normally 1 on 6 per 8 mile travelled, here it is always 3 on 6 per mile covered, and this is checked literally each mile, and as the travellers are mostly unaware of faulty directions, they will get reorientated regularly. Last edited by Robin on Mon Jan 07, 2019 3:17 pm, edited 1 time in total. So the holidays are over, the new year has begun, so I restart my work here. Here the continuated research on the history of Ethengar Mystara. Above the 3050BC map with New Blackmoor Colony settlement, from the maps by Sturm. Many of the names are created by me, in agreement with Sturm. To enable location of these settlements I had to calculate each position before and after the 3000BC disaster/planetary tilt. 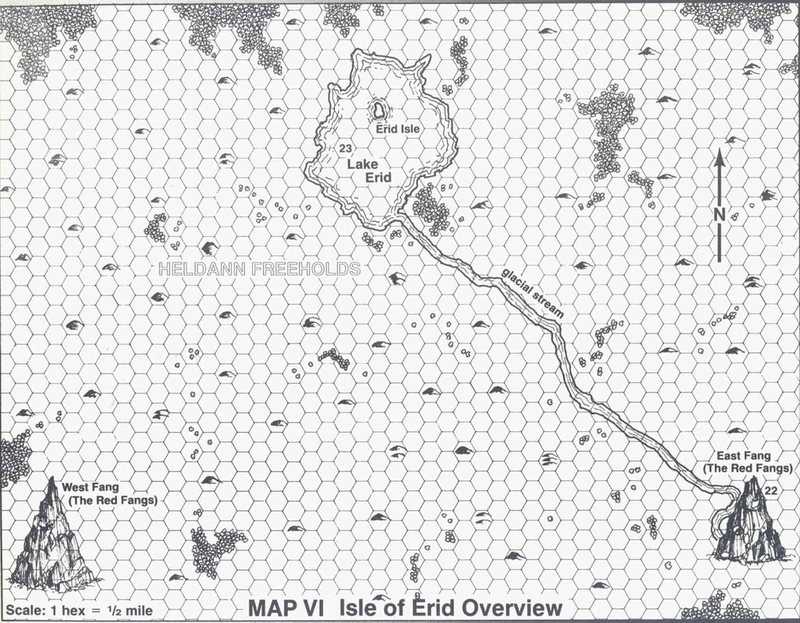 Now the result is the map left, where the rednames are the locations of former New Blackmoor colony settlements. All these have turned into ruins, some of these ruins have turned into a base for later settlements, others just eroded away, and the remaining are just ruins. Important to note is the Streel-Krandai River. In the 1000AC period it streams from north and east (near the sea) and south from the Dwarven Mountains to the southwest. In 3050BC its flow was from north towards the east instead. This direction was altered due to the elevation of the Plateaux, causing the river to flow southwest and create a large lake against the mountains there, which emptied due various reasons after the Broken Lands were created. 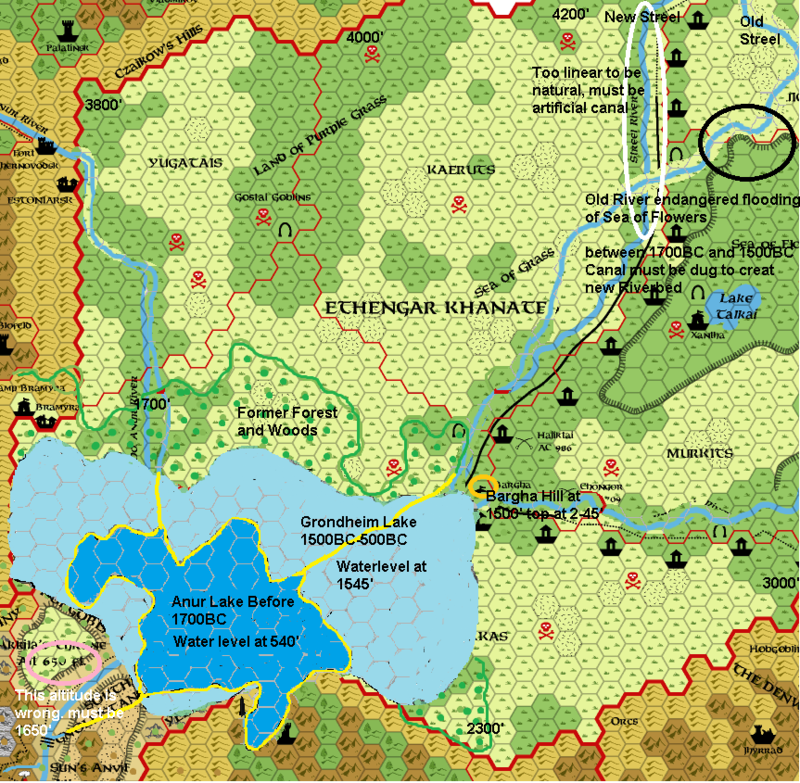 The region between Ethes and the Aral Lake are almost level, and the lake is fed by the mountain streams (not mapped) and the Dol-Anur(also not mapped on the 3050BC map) and flows towards Ethesh meeting the Streel and flowing down to the sea into the Krandai River. The increment of elevation was done slowly over time, in which the Aral Lake grew(as the water no longer could be directed towards the sea). I assume the Sea of Flowers and the Chagon-Nah depression were created in the same time, and at least Chagon-Nah must have been a vast lake too in the 2300BC period to 1700BC and fully gone near 1500BC. This not only would explain why the region is still a seasonal wetland, but also explains where most of the water stayed. It also is preceded somewhat on the 3050BC map of Sturm, where a lake can be seen where the Dwarven and Streel-Krandai Rivers meet. How the water went through the Broken Lands later is a fully other case, which I will explain soon (really). This assumption also further strengthens the idea of a more wet future of Ethengar (1200AC) as I presumed in this map earlier. All in all the continuated process of elevation of the Ethengar Plateaux (and I assume it still continues) not only diverted rivers in opposite directions, it created deep hills in the Heldann Freeholds and the eastern coast of Vestland. Both these regions tilt down as the cells of the Ethengar Plateaux end there. The local cells were uplifted much less in this process and have succumbed only to a tilt up towards the plateaux. If the plateaux still continues to elevated, serious cliffs will come to be, instead the now rough but still eroded hilllands. In the far future the Heldann and Vestland sides of the pateaux will resemble (more or less) the steep walls of the Atruaghin Plateaux, probably though with several access areas of broken lands. The maps makes it clear for me to locate all the ruins in its current (1000AC+) period to be placed in the 1 mile hex maps. enjoy and discuss your opinions here. I would greatly enjoy any input. Last edited by Robin on Mon Jan 07, 2019 6:05 pm, edited 1 time in total. To proof I am still working on the map(s) of Ethengar, here the base of the mid north section of the gigantic map. 09-01-2019; enlarging, and overlaying with 1 mile hexes until correct fit, copy paste earlier (not with hex overlay) material so much restoration work. basic work mainly. Probably working and repairing a few times till I get the base right. Especiallly the World Mountain and the section south of it has major discrepancies which I have to repair/shift, etc to maintain a fitting map. The Streel is the new (more straight canalized) and the oldd curvy from before 1700BC. this old one will be nothing more than a muddy region with pools and reedlands basically, while the new will have hills(created from digging the canal) on either side. This way I can show the image here to all, and those interested can use the extra link to see it in detail. Clearly the artificial structure of the new Streel becomes clear...reasonably linear (north to south with minimum diversions (these surely would have not been intended, but caused by measurement flaws of the Dwarves and Ethengar who did dig this area up and transported the debris to west/east to create dams), dams to eitherside to keep the river where it is (although it slithers and twists and turns between these where possible due the relative flat surface), a wide area in between to allow the river to wax and wane seasonally without flooding elsewhere. As before, any input is welcome. Ok The work of Today. Second; The source of this water was mostly within the Heldann Hills. Thirdly; The canon and fanon maps seem to have elevated the Heldann hills above the Ethengar Plateaux to allow the Streel River flow ON the plateaux. Issue 1; cannnot be completely canon resolved due the other issues. issue 2; Not only is it without magic near impossible to allow such a grand river be born from mere hills, especially not without at least several (and I mean more than 10) additional side rivers and many creeks. Issue 3; This on itself would not be a great problem, were it not for the Heldann Freeholds being at general sea level (0) and the rising inland up. This would cause major elevations and breaks of the plateaux and the Streel flowing into the Heldann Freeholds instead out onto the Plateaux of Ethengar. Here the best treatment is to watch the general geomorphology to determine general altitudes and flow patterns. First, More sources and grand sources must be created to allow the amount of water to be collected and giving a major flow. This I did. Secondly the major sources are best to be mountains which capture the weather patterns, and collect water in the form of snow, ice or water in/on the Stone. I caused two major streams one from the Glantrian Mountains in the west Flowing in a general southeast direction towards the most common used canon source of the Streel River. I added a second source from the Red Spires in the East of Heldann, flowing generally west to south-west meeting the second most used canon/fanon option of being the source. Mixing this together with the 2300BC , 3050BC maps we get a duofold source for the Streel, extra fed by a multitide of creeks. The Logic of the dams created by the Dwarves/Ethengars becomes much clearer now. Not only does this prevent a very possible major flooding disaster on the most fertile ground of the Ethengar Khanates(in effect not known to them then inevitable), but also binding the two sources together making it the largest river of the Known World (as it was told canonnically in the older sources). I created an erosion effect in these hills, to accomodate the upper source rivers, and thus making it into a fertle section of hills where forests are and agricultural gound is used...and thus villages would exist...making the bleak canon area more alive, logical and interesting..(i still have to decide which I should call the Streel and how to call the Other (any ideas/input are more than welcome. Secondly; Then there is the issue with the altitudes and Heldann. to resolve this I have decided to keep a section of Heldann Hills on or attached to the Plateaux, breaking in long cliffs and deep hills with broken lands sections, allowing other water north of these cliffs flowing into Heldann. Not only will this make the area much more interesting as PC/DM users, it will also allow the Heldannto use these hills with small forests/farmlands/valleys/cliffs/roars etc as the text of this region describes...thus not an empty boring single mass of hills. This same technique I will apply on the far east where the angle is even greater (4000 feet or more to sea level in only a few 8 mile hexes). Thirdly; Then I created the northern section of the cliffs of the Sea of Flowers. Canonnically there is nothing mentioned about ways to enter the area, so I devised the cliffs as being a series of volcanic depressions/collapses while the plateaux itself did rise, causing a sort of multi-faceted step series of cliffs. And lastly; Then I detailed the Old and New streel with reed, pools, the twisting river, and where the rivers sort-off cross a Dwarven Lock enabling the seasonal water collected in the Old Streel to flow into the New Streel without flowing back, or flowing down its older southern section. The dwarves and Ethengerians did an amazing job in creating this primitive canal in 1700-1500BC aftere the disaster (they did this as described above to prevent their only fertile remaining land from flooding, as the others were distroyed in the disaster and the flooding thereafter as the water was blocked by the New Broken Lands. Look at the map and tell me if you like it. The southern section of the Sea of Flowers will be done later...now I need to relax...pfewwwwwwwwwwwwwww. So awake and active....removed the keyboard indentations from my face .....yet stalled somewhat due inclarities. Cannonnically there have been several incursions of the ethengar against Heldann Settlement. Yet I can't Find the canon source for this. I also know that some fans have placed attacked Heldann settlements (now ruins or just abandoned) in the region. I can't find these either. So could anybody (the more the merrier) help me in locating these locations? I already have the battlefields in the north, yet I don't feel all of these shouel/could/would have been former Heldann settlements, probably these battlefields were more just conflict zones with large casualties.. There were certainly mentions both in Wrath of the Immortals and The Poor Wizard's Almanac of raids near Grauenberg, but I do not think nor recall there was anything else more precise or maps. Thanx. ..I am going to check those. 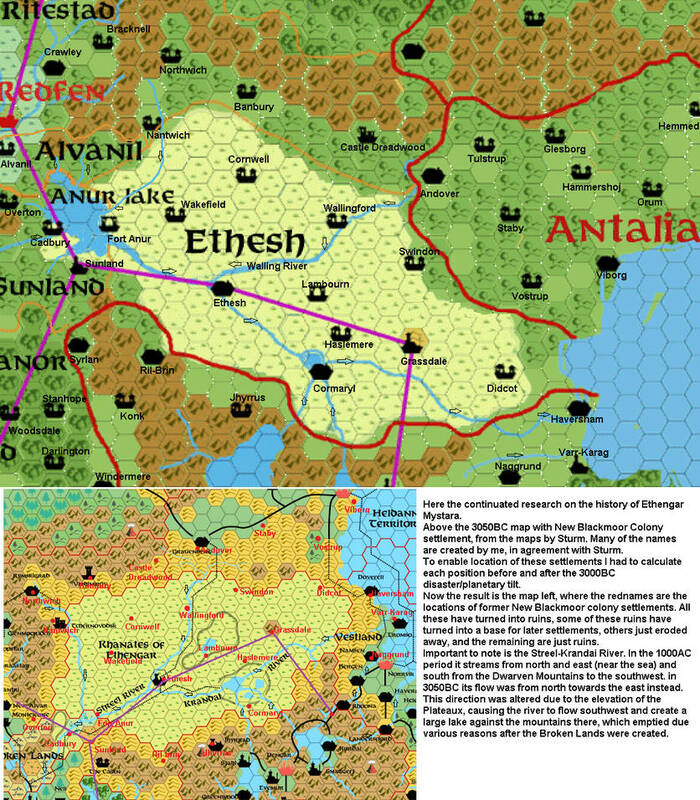 The fanon (of what I remembered) seem to be about defeated villages near Ethengar ..no more detail I remember. 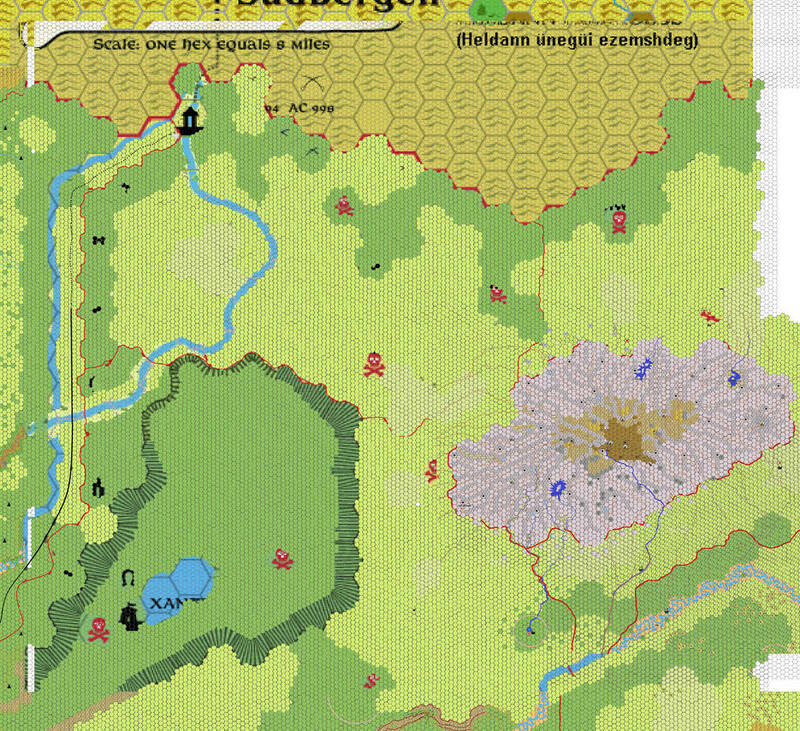 Another point the map of the HeldannFreeholds in TSR 9218 - X13 - Crown of Ancient Glory clearly state the water from the East Fang of the Red Fangs Mountain is a Glacial Stream. I could create a hollow side on the north where a Glacier could exist, however, that side would not appear to be a spire than anymore. Also if one spire would have acces to a Glacier, and the Glantrian mountains in the west also have, would the west spire not have something similar? 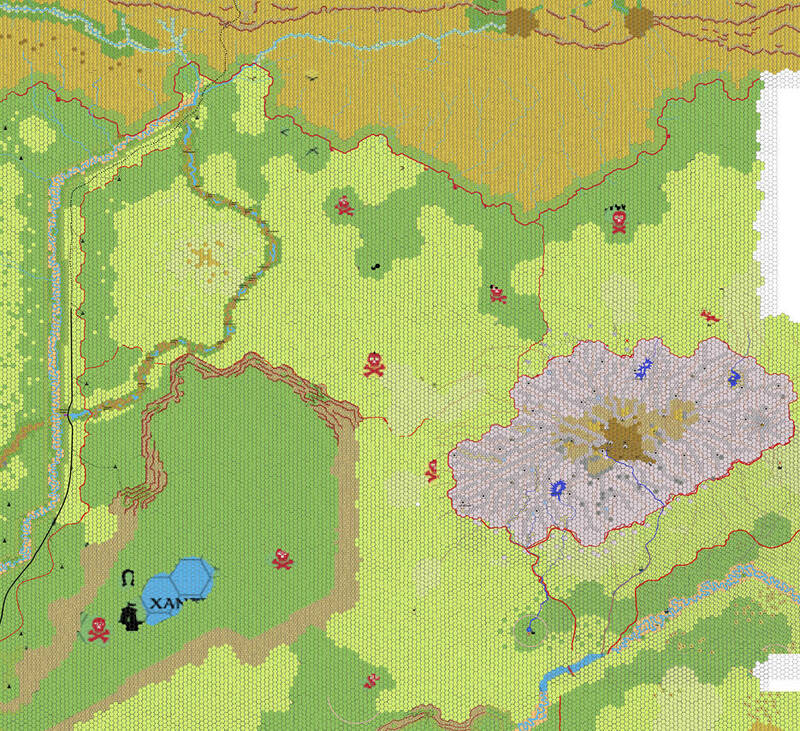 The information in this map is very sparse...I and a mixture of flat hex map and 'isometricish' mountains.....so I could reasonably easy alter this....It also holds only a few hill hexes placed, seeming the area is more flat, while the area is cannonically a vast hill territory. This a clear flaw, which I already corrected towards the Heldann canon information and the very good map of http://www.pandius.com/heldann.gif by JTR (where I would only ad the Rivers I suggested feeding the Streel logically) and the wonderful handdrawn map of Geoff Gander http://www.pandius.com/heldann.jpg which are seperate interesting, yet different, but I intend to Fuse all these together into one (maybe I am doing a 1mile hex map of Whole Heldann Freeholds in the Far Future). I Intend to use the location of these points marked as hills on the map as the top of the hills (as I only use the most southern section with the Fangs. I have to ponder on this especially in the NE Ethengar map later.